Beachy Head: Summary of Autumn, 2018 at Beachy Head. Summary of Autumn, 2018 at Beachy Head. This Autumn 2018 summary was extracted out of the Beachy Head log and includes bird records of a few local observers and includes details from Robert Edgar who runs the Beachy Head Ringing Group (BHRG) which operates from Whitbread Hollow. Unfortunately virtually no sea-watching was carried out this Autumn other than casual looking out whilst birding around the various sites. Autumn: 31/10 1 on the sea and 3/11 1 on the sea. Autumn: Recorded up to 31/10. 30/7 124 (41 E and 83 W), 12/8 60 E and 18/10 40 feeding off Birling. Autumn: Parties of 14 W and 5 E on the 18/7 and 8 E on the 4/8. Autumn: Recorded on 8 dates from 8/8 to 31/10, chiefly singles on Birling beach, with 3 flying over the Downs behind Whitbread Hollow on the 17/8. 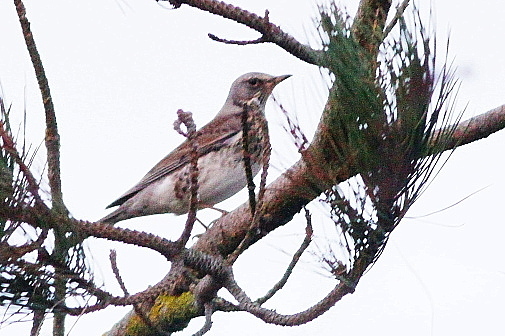 Autumn: Just a single bird E out to sea off Birling on the 29/9. Autumn: (virtually no sea-watching carried out during the Autumn) 30/7 6E and 31/10 1E. 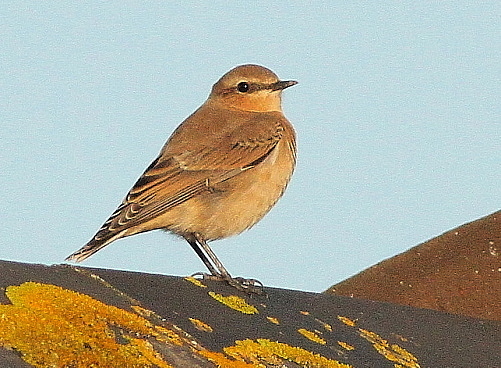 Autumn: 30/8 5 on the sea off Cow Gap, 9/10 1 juv on the beach at Birling and 17/10 1 flew over the Headland. A strange sighting was of this juvenile Mute Swan paddling on Birling beach. Autumn: Recorded on 44 dates from 3/7 to 23/11. Daily maxs: 28/8 (15), 29/8 (10), 1/9 (15 including 11 in a kettle over the top fields), 29/9 (11 including 10 over Crowlink). 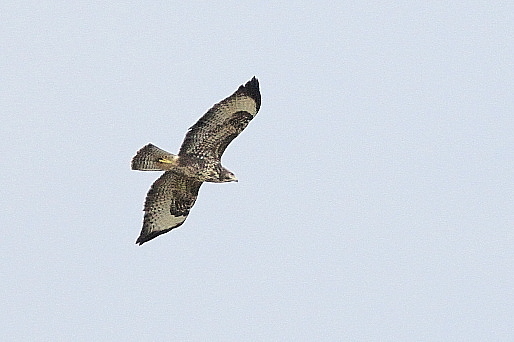 Common Buzzard over the Headland. Autumn: Recorded on 50 dates with a total of 83 bird-days and a daily maximum of 5 on the 1/9 (3 on the Headland and 2 in the Hollow). Two were also seen at Crowlink on the 29/9. 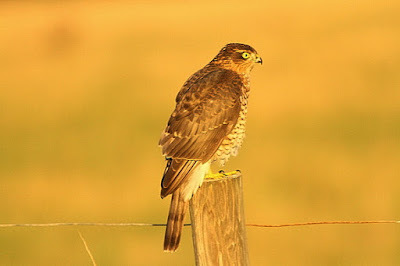 Sparrowhawk taken at dawn along the Birling road. Autumn: 4/8, 3 soaring over Belle Tout wood, and 7/8 1 E over Shooters Bottom. Autumn: One went S out to sea at 13.33 hrs. photos (LP, SL, GG) . 2018: Autumn: Singles recorded on 8 dates from 4/8 to 29/9., one of which moved E out to sea off Birling. It was difficult to be sure how many different individuals were involved. 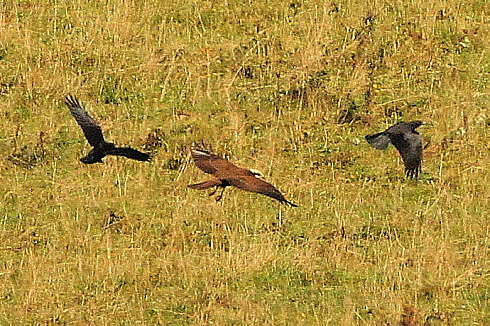 Two of the Marsh Harriers seen on the Headland this Autumn. Autumn: 29/9 1 SE over Shooters Bottom at 12.45. (RB). Autumn: Singles recorded on 9 dates from 19/7 to 30/9. Autumn: Recorded throughout the Autumn but never more than 3 on a day. 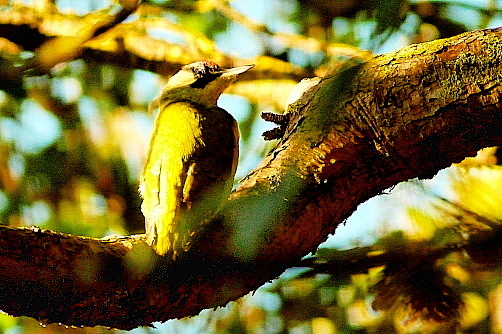 Several juveniles were seen. 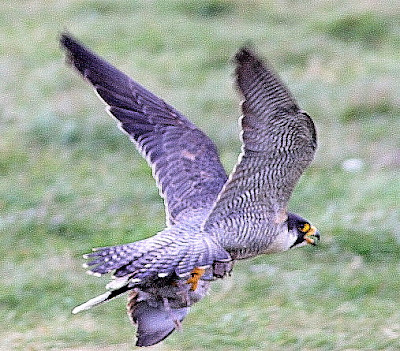 A quick fly past of an adult Peregrine with prey at Birling Gap. Autumn: Singles recorded on 6 dates from 2/9 to 25/10 all from the Headland sites. Autumn: Recorded throughout on 51 dates with 6 on the 7/9 (5 on the Headland and 1 in the Hollow). 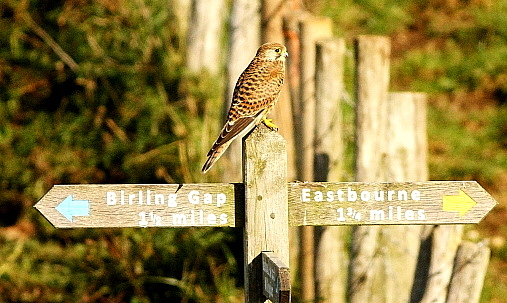 Kestrel sat opposite Shooters Bottom. Autumn: Recorded on 8 dates from 18/7 to 9/10 with up to 8 on a day chiefly in the Birling area although 5 were also seen in Cow Gap on the 2/8. 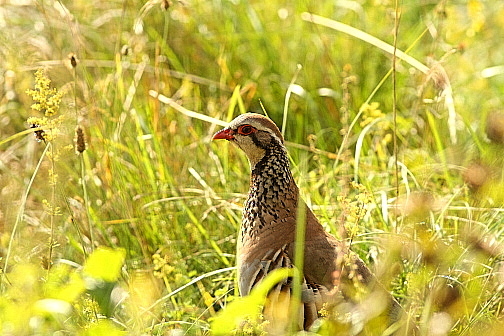 Red-legged Partridge in the set-aside field. Autumn: Just recorded on 3 dates. 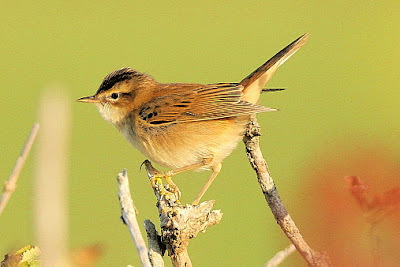 On the 18/8 3 full grown young were standing on the road near Belle Tout wood. Autumn: up to 10 present on Birling beach. 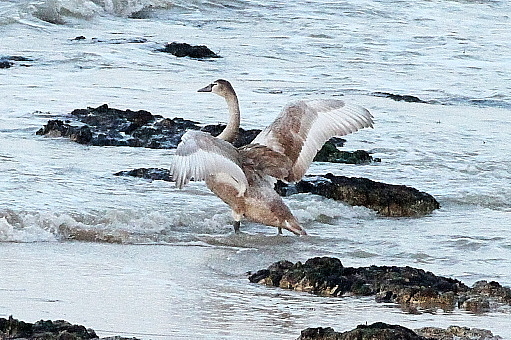 Autumn: 29/10 5 flew over the Headland and 17/11 c80 E out to sea. Autumn: Recorded on 6 dates from 22/8 to 27/11 with a daily max: 17/11 (6 over Headland). 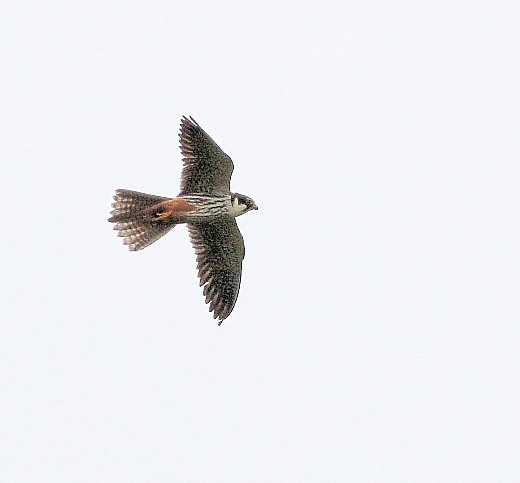 Autumn: 6/11 2 (1 taken by a Peregrine on the Headland and 1 Long Down) and 11/11 1 Long Down. Autumn: 13/7 1 in off the sea and 4/8 1 E.
Autumn: 30/7 5W, 7/8 1 flew over the top fields, 1/9 4W over the top fields and then flew out to sea. Autumn: 4/8 1 ad. E off Birling. Autumn: 8/9 1 cy. In fields at Birling (J.Partridge). 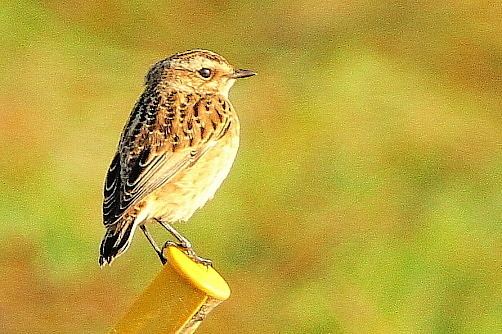 Autumn: 1 juv. above the cliffs at the Old Trapping Area. Autumn (No sea-watching was carried out this Autumn). 13/9 1 off Birling. Autumn: 31/10 12 E and 3 W.
Autumn: Recorded on 7 dates from 5/9 (2) to 17/11. Daily maxs: 20/10 10 E with Wood Pigeons, 29/10 11 on the Headland and 17/11 50 over the Headland. 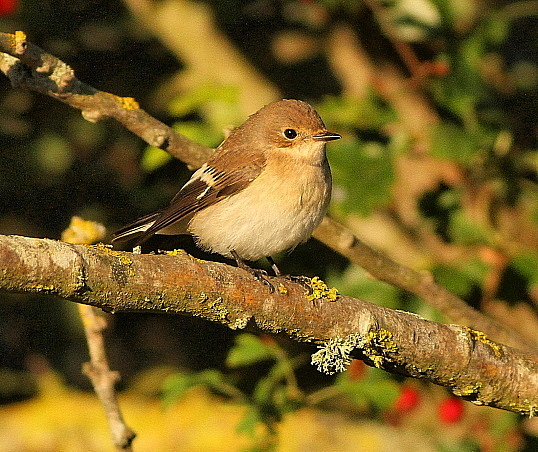 Autumn: Recorded throughpout the Autumn with upto 50 present in Whitbread Hollow and similar numbers on the Headland. Movements recorded from late October with daily maxs: 20/10 (150W and 80 E), 21/10 (400), 24/10 (250 over Whitbread Hollow, 29/10 (300 over Birling and 17/11 (200 over the Headland). Autumn: 26/8 ( 1 Old Trapping Area), 13/9 (1 on the Headland) and 22/9 (1 Shooters Bottom departed W). Autumn: Just recorded on 5 dates from 31/7 to 22/10 with only 5 birds seen. Autumn: Just 3 sigthtings, 3/7 1 juv Shooters Bottom, 4/8 and 9/8 1 Old Trapping Area. 1/9 One flushed from the Cattle Field above Whitbread Hollow. (RAB). Just our 8th record since 1960. Autumn: No further sightings were logged for Belle Tout wood, but up to 3 present in Whitbread Hollow/Holywell area all Autumn. Autumn: Recorded on four dates: 25/8 2 (1 Headland and 1 Crowlink), 22/10 1 Shooters Bottom, 29/10 1 out to sea flying past Cow Gap, 22/11 1 sitting on a fence along the road near Shooters Bottom. Our 11th record since 1960. Autumn: Recorded on 14 dates from 3/7 (c40 E ) to 13/9 (1). Daily maxs: 29/7 60W and 3/8 c550+ (150W during the morning and 400+ feeding over the top fields during the evening). Autumn: Chiefly singles seen throughout the Autumn on both the Headland and in Whitbread Hollow with just one day when 3 were seen on the 14/8 with 2 on the Headland and 1 in Whitbread Hollow. 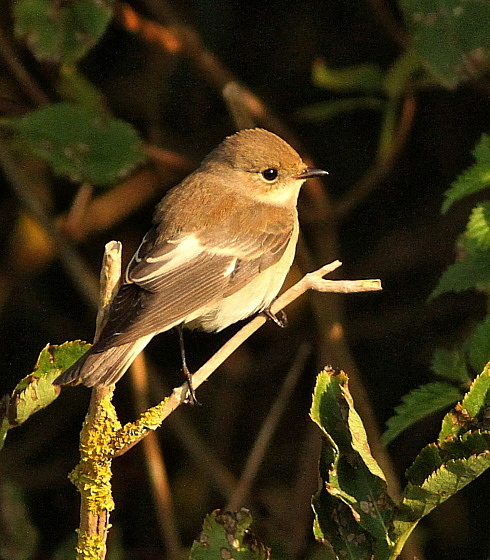 A single juvenile was seen in the Belle Tout/Birling area during the Autumn. Autumn: Recorded on 24 dates from 5/8 to 29/10. 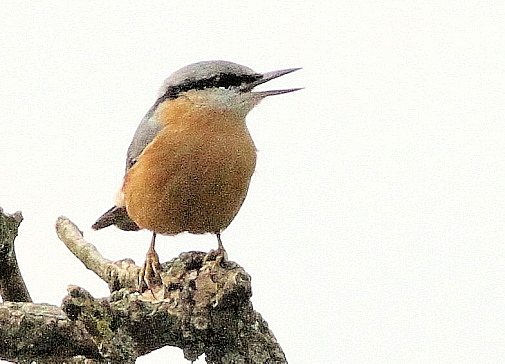 Chiefly singles but never more than two on a day with just the odd juvenile bird was seen. 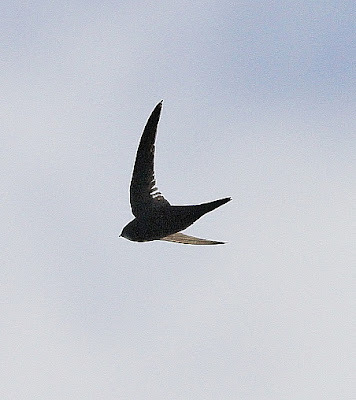 Records from both Whitbread Hollow and the Headland and individuals are often seen flying from one site to another. 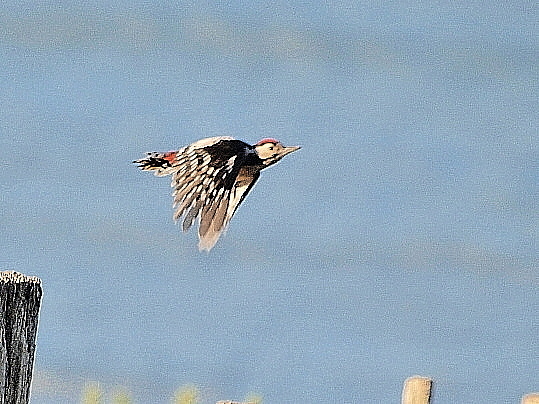 Juvenile Great-spotted Woodpecker flying between sites on the Headland. Sadly no sightings recorded this year. Autumn: 3 moving over the Headland on the 20/10. (ASC). Autumn: Movements: 5/10 15 E, 14/10 20 E, 20/10 c40 E. Only low numbers found feeding in the set-a-side field as follows: 26/9 (25), 9/10 (30), 22/10 (70) and 4/12 (30). Autumn: Recorded on 48 dates from 3/7 to 14/11 (2W). July and Aug: Only low numbers recorded with max. of 40 on a day until the 31/8 when 2,000 moved E.
Sept to Nov: Daily maxs: 3/9 c700 chiefly E, 25/9 2,000 chiefly E and 26/9 2,000 E. Numbers then dropped off. Generally a very disappointing Spring and Autumn passage considering observer coverage was good during the Autumn. 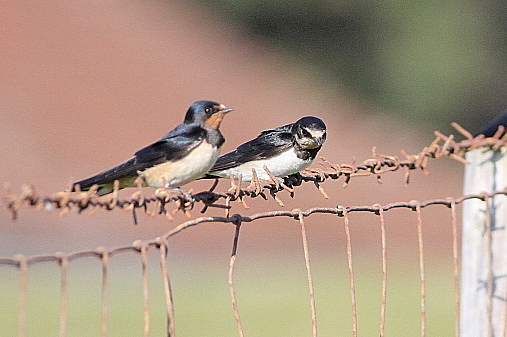 Swallows resting up along Birling lane before their long migration. Autumn: Recorded on thirty dates from 14/8 (1) to 15/10 (6), with daily maxs: 3/9 (500 chiefly E), 10/9 915 (315 W and 600 present in the Hollow), 24/9 (2,000 chiefly W), 25/9 (c6,000 chiefly W, with two counts made showing birds were passing at the rate of 250 per minute on a broad front). 30/9 600 (500+ Whitbread Hollow and 100 on the Headland). House Martins feeding near the cliff edge at Birling whilst on migration. Autumn: Recorded on 25 dates from 29/6 (12) to 26/9 (8). A total of just 267 bird-days logged with a daily max of 40 on the 31/8. A very poor Autumn and must be one of our poorest to date, after another early start at the end of June. 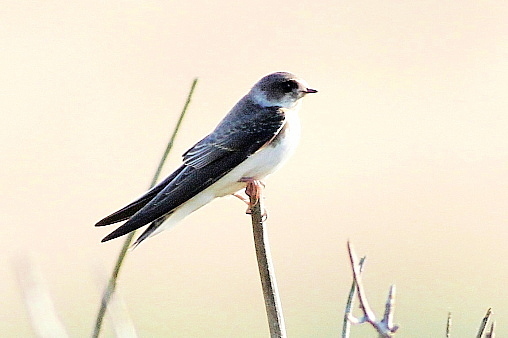 Sand Martin having a short rest whilst on migration at Birling. Autumn: Odd birds recorded throughout, with the following parties: 13/7 5 juvenile types feeding on the beach at Birling, 11/8 6, 24/10 8(3 Hollow and 5 Headland). Probably 2-3 pairs breeding on the cliffs. Good numbers were again present throughout the year. 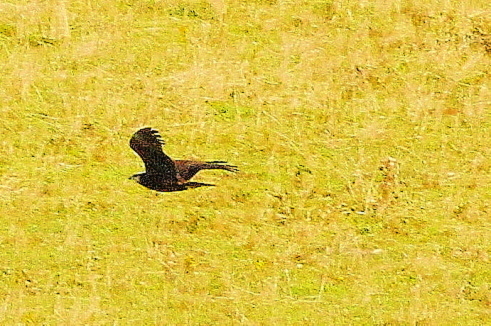 On the 20/10 a party of 16 flew high over the Headland moving W.
Autumn: The pair was again present in Whitbread Hollow area during the Autumn, with 3 there on the 3/10. Odd birds were also recorded from the Headland as follows: 14/9 3 (2 Cow Gap and 1 Shooters Bottom which departed E), 26/9 2 (1 Shooters Bottom and 1 Old Trapping Area), 9/10 1 Cattle Field, 16/10 1 Hotel Garden. Autumn: 9/11 One seen briefly in Belle Tout wood but was not identified as to race. Autumn: Recorded on 8 dates from 18/8 to 16/10 but never more than 6 on a day, with most records coming from the Whitbread Hollow area. Autumn: 31/8 One toured around the Headland and visited the Old Trapping Area, Shooters Bottom and the toilet block bushes. 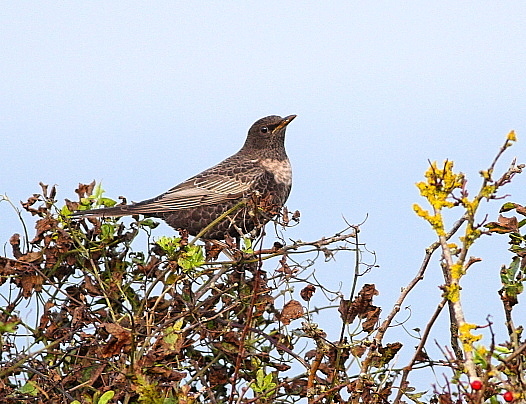 Our 14th record since 1960.
on Beachy Head than Pallas's Leaf Warbler. 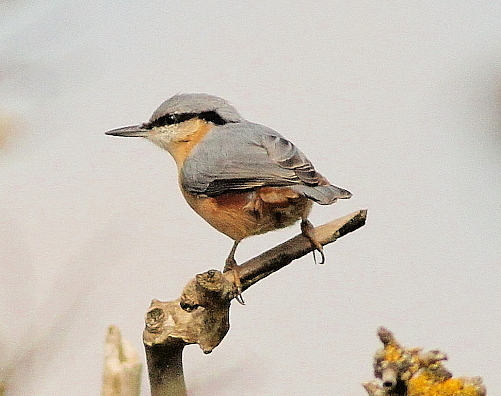 2018: Autumn: What was assumed to be the same bird was present in Belle Tout wood from 9/9 to 4/12. 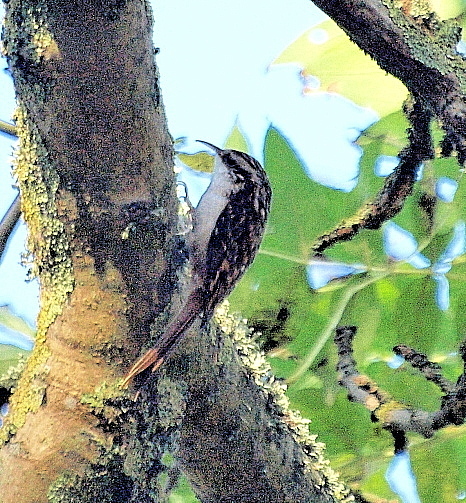 Tree Creeper in Belle Tout wood. Autumn: Reasonable numbers present, but no specific counts were made, although probably no more than 10 on a day. 27 were ringed in Whitbread Hollow this Autumn. Ringing recovery:Aged 3 ringed 23/9/17, ring found, Hardwick Hall, Chesterfield, Notts, 18/4/18. 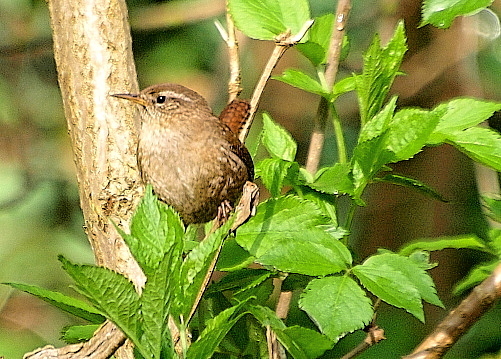 Wren in Belle Tout wood. recovered in April, 2018 in Nottinghamshire. 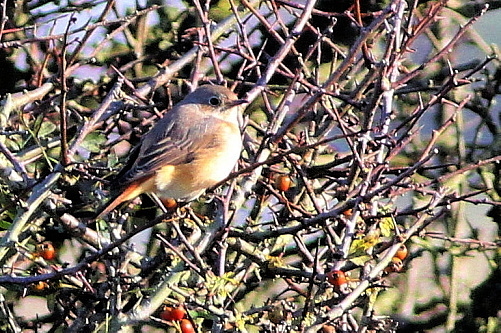 Autumn: Again just a single bird seen on the 4/11 which flew over Belle Tout. Autumn: Recorded on 5 dates with a total of just 66 bird-days from 22/10 (1E) to 4/12 (60 feeding on berries at Long Down). Autumn: Small numbers recorded throughout the Autumn. Daily maxs: 26/9 12 present in the early morning, 20/10 16 present mainly in Shooters Bottom. 17 were ringed in Whitbread Hollow this Autumn including several continental migrants. Autumn: Logged on 8 dates With a total of 121 bird-days from 8/10 (9), to 4/12 (50). Autumn: Recorded on 16 dates from 25/9 to 4/12 with a total of 33 bird-days. Daily maxs: 17/10 8 ( 6 Old Trapping Area and 2 Shooters Bottom) and 18/10 (5 along the Cliff Path). Poorish Autumn. Two previous December records in the 1960’s with our latest being on the 8th December. Autumn: Small numbers recorded throughout the Autumn. 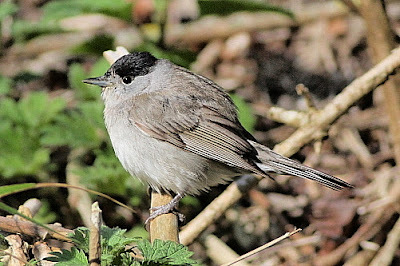 Influxes as follows: 4/10 25 nearly all males were present in Shooters Bottom, 9/10 25 of which 20 were present in Whitbread Hollow, on the 14/10 and 20/10, 30 were present on the Headland, 16/11 50 of which 15 were in Whitbread Hollow and 35 on the Headland. 19 were ringed in Whitbread Hollow this Autumn. Autumn: Recorded on 35 dates from 4/8 to 22/10 with a total of 150 bird-days with Daily maxs: 23/8 (14), 26/8 (14) and 5/9 (16). Another poor showing this Autumn. 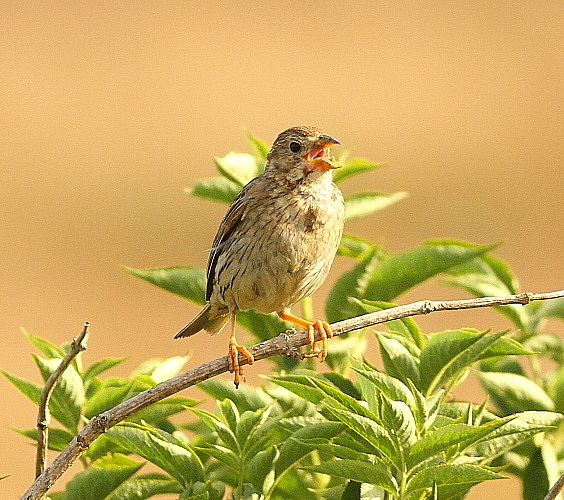 Autumn: Present throughout, although only a few juvenile birds were seen in July and numbers recorded during the Autumn were on the low side. On the 12/8 (14) were logged and on the 12/9 12 were logged. On the 4/12 a pair were present in the set-aside field. 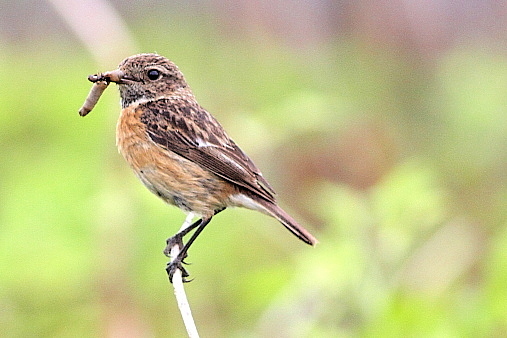 Female Stonechat collecting food in Shooters Bottom. Autumn: Recorded on 21 dates from 11/7 to 26/9 with a total of 108 bird-days with daily maxs: 4/9 (11), 10/9 (21), and 16/9 (15). 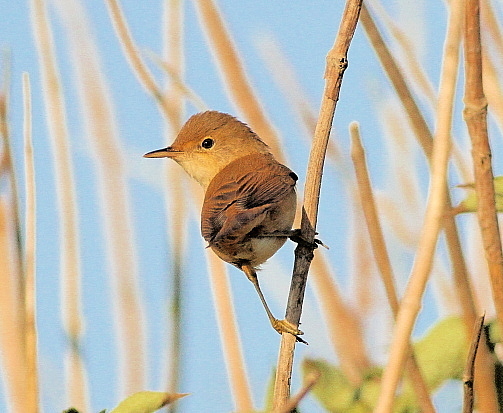 Our best Autumn since 2006 when a total of 144 bird-days were recorded. Autumn: Recorded on 21 dates from 4/8 to 9/10, with a total of just 51 bird-days with daily maxs: 5 on the 25/8, 26/8 and 30/8. Autumn: Recorded on 10 dates from 31/7 to 18/10, with a total of 12 bird-days with daily maxs. of 2 on the 22/9, 5/10 and 18/10. This probably involved 11 different individuals. 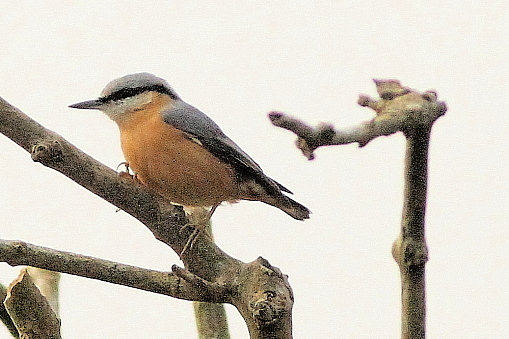 (RHC only recorded a single bird in Hodcombe during the Autumn although he was away for some of this time). Of interest, two very juvenile plumage birds were seen one on the 31/7 in The Hotel Garden and 1 on the 4/8 at Birling, which may involved local breeding. 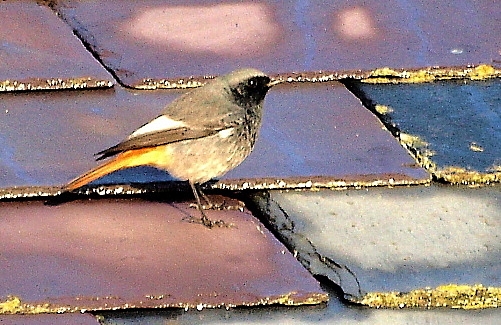 Male Black Redstart at Birling Gap. 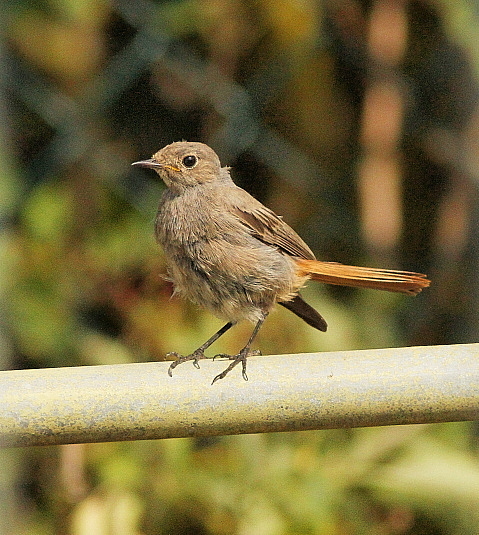 Juvenile Black Redstart in the Hotel Garden. Autumn: Recorded on 11 dates from 6/7 (an early adult migrant was calling a lot and also a short song burst and showed well in Shooters Bottom) to 21/8. A total of 13 bird-days, probably involving 9 different individuals with a daily max of 3 (2 Shooters Bottom and 1 in Whitbread Hollow). 6 were ringed in Whitbread Hollow this Autumn. Autumn: Recorded throughout with daily maxs: 26/9 20 on the Headland, 5/10 20 present on the whole area, 9/10 18 with 10 in the Hollow and 8 on the Headland, 14/10 20 on the Headland. 58 were ringed in Whitbread Hollow this Autumn. One present at Birling lane from 16/11 to 23/11 photo (LP. RDME). With daily maxs: 1/8 (5), 11/8 (5), 26/8 (6) 30/8 (5). Again Whitbread Hollow recorded most of these records with the majority being trapped and ringed by the BHRG. On the 2/9 the gropper field in Cow Gap was visited and 4 birds were seen. 38 were ringed this Autumn in Whitbread Hollow. Our best Autumn for some time. 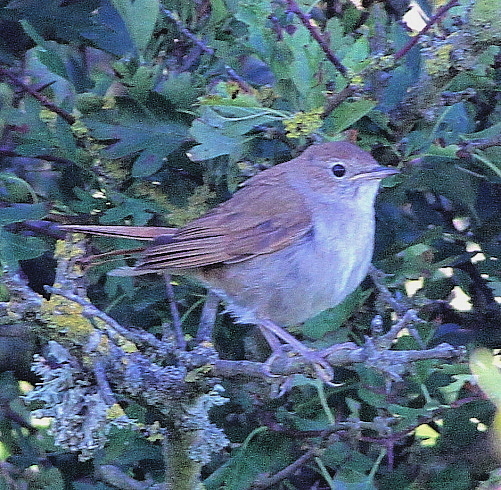 Grasshopper Warbler in Shooters Bottom. 1/9 19 (15 Hollow 4 Headland). 98 were ringed this Autumn in Whitbread Hollow. Age 3 ringed 13/8/17 controlled Wilstone Reservoir, near Tring, Herts 1/7/18. Age 3 ringed 20/9/14 controlled Waterham, Kent 30/6/18 and 19/7/18. Age 3 ringed 24/7/18 at Titchfield Haven NNR, Hants controlled 5/8/18. 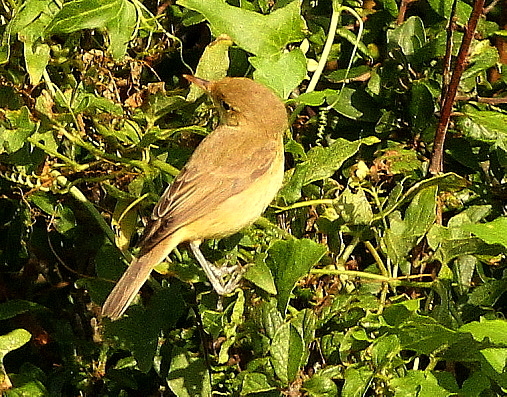 1stW Reed Warbler at Birling Gap. 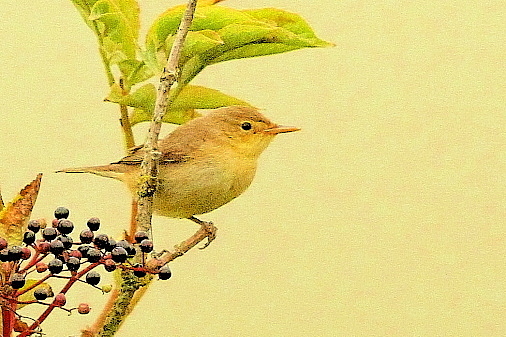 1stW Reed Warbler in the Hotel Garden. 2/8 15 (14 Headland and 1 Hollow), 17/8 8 (6 Headland and 1 Hollow). 18 were ringed this Autumn in Whitbread Hollow. An average Autumn by recent standards, although for comparison in 1976 265 bird-days were logged during the Autumn. Our latest date occurred on the 21/10/2002. One present in the Toilet block bushes before moving to the Hotel Garden from 20/8 to 25/8. Spent 6 days and our 38th record since 1960. Autumn: Singles reported on 5 dates from 25/10 to 17/11 in the gorse area between Belle Tout and Birling Gap and probably related to a single bird. Autumn: Recorded on 67 dates from 3/7 (1) to 15/11 (1). A total of 2,696 bird-days with Daily Maxs: 26/8 (150), 4/9 (110), 6/9 (125), 8/9 (111), 22/9 (403), 24/9 (111), 25/9 (370), 27/9 (150). Age 3 male ringed 21/8/18 controlled Sandwich Bay, Kent 2/9/18. Age 3 juv. male ringed 30/6/18 at Eccles-on-Sea Norfolk controlled 1/9/18 as a female. Age 3 juv. female ringed 20/8/17 controlled Bondhay Farm, Whitwell, Derby 25/9/18. Age 3 male ringed 1/9/18 controlled Mickley Sq. Northumberland 8/9/18. Generally a poorish Spring and this probably reflected on the numbers seen during the Autumn, and as usual most birds were recorded in Whitbread Hollow. Male Blackcap feeding on the ground in Belle Tout wood. 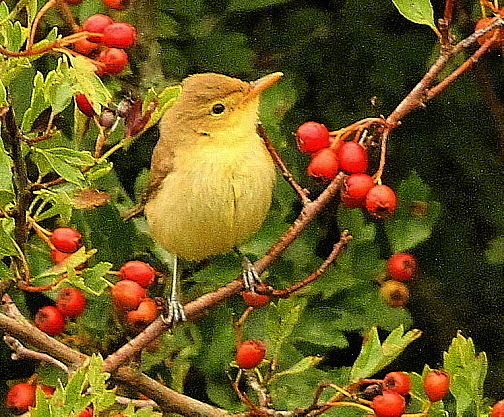 Autumn: Recorded on 18 dates from 24/7 to 10/9 with a total of just 40 bird-days. Daily Max: 28/8 8 (2 in the Old Trapping Area and 6 Hollow). 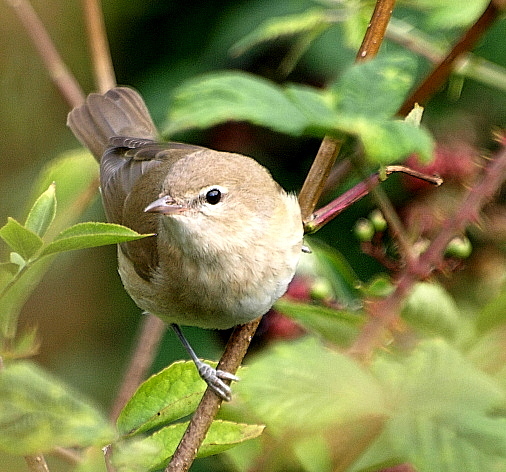 Garden Warbler in Shooters Bottom. Autumn: Recorded on 38 dates from 3/7 to 16/9. A total of 130 bird-days with a daily max of 12 on the 17/8 (9 on the Headland and 3 in the Hollow). Just 5 were ringed this Autumn in Whitbread Hollow and for comparison a total of 320 were ringed in 1975 in Whitbread Hollow. 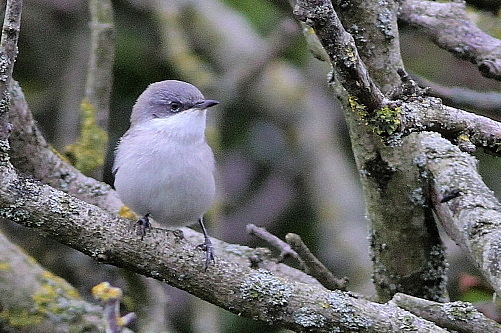 Lesser Whitethroat in the Old Trapping Area. Autumn: Recorded on 49 dates from 6/7 to 26/9 with a total of 1,407 bird-days. Daily maxs: 17/8 120 (90 Headland and 30 Hollow), 26/8 160 (100 Hollow and 60 Headland), 28/8 110 (80 Headland and 30 Hollow). 91 were ringed in Whitbread Hollow this Autumn. Autumn: Recorded on 43 dates from 18/7 (1) to 24/9 (1). A total of 986 bird-days with daily maxs: 17/8 145 (115 Headland 30 Hollow) and 22/8 c100 Headland. 123 were ringed in Whitbread Hollow this Autumn. Autumn: Recorded on 63 dates from 9/7 (1) to 16/11 (1). A total of 2,980 bird-days with Daily maxs: 14/9 100 (50 Hollow and 50 Headland), 25/9 450 (400 Hollow and 50 Headland), 3/10 200 in the Hollow. 742 were ringed this Autumn in Whitbread Hollow. Age 4 ringed 27/10/17 controlled at Rye Meads, 1/1/18. Age 3 ringed 3/11/17 controlled Alnwick, Northumberland 13/4/18. Age 3 ringed 30/9/18 found dead at Villava, Navarra, Spain 10/10/18. Age 3 juv ringed 18/8/18 at Birtley Sewage Farm, Tyne and Wear, controlled 17/10/18. 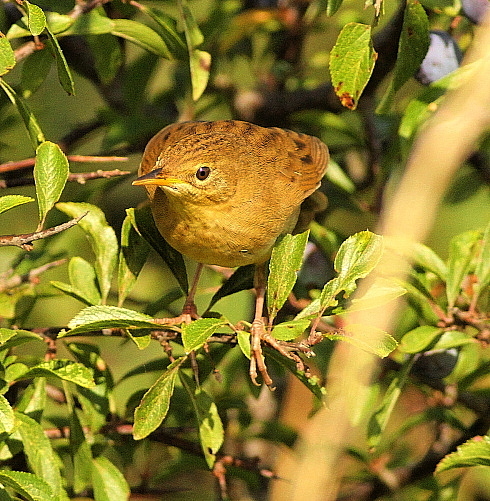 Generally a poor Spring migration as with other migrants, but an excellent Autumn with some large falls of migrants. Our 9th record since 1960. Autumn: 25/8 1 trapped Whitbread Hollow. Seven different individuals and now brings our total to 104 birds. 2018:5/11 to 6/11 One in the Old Trapping Area although quite elusive. (LP, RHC, JFC et al). Our 52nd record since 1960. Autumn: Recorded on 23 dates from 14/8 (1) to 4/12 (2). A total of 543 bird-days. Daily maxs: 21/10 (42), 4/11 (80), 9/11 (155), 11/11 c80. RHC also had good numbers in Hodcombe during this period. 114 were ringed this Autumn in Whitbread Hollow. Again a terrible Spring with just odd birds seen, but a very good late Autumn and the totals would have been higher as fewer visits by birders are made in November. 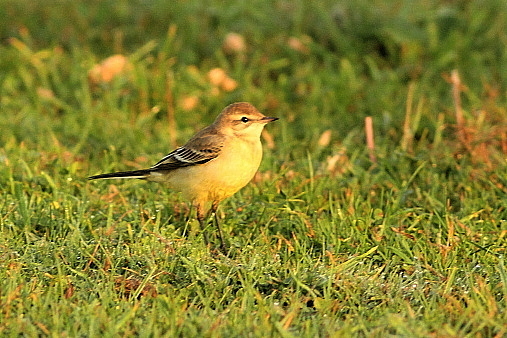 Autumn: Recorded on 15 dates from 1/9 (1) to 17/11 (1) and with a total of 20 bird-days. Probably involving 17 different individuals. with a daily max: 5/11 (4). 3 birds were ringed this Autumn in Whitbread Hollow compared with 16 last year. An average Spring and Autumn. 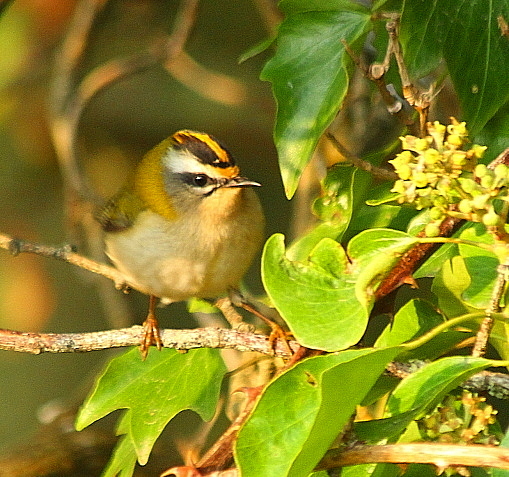 Firecrest in Belle Tout wood. 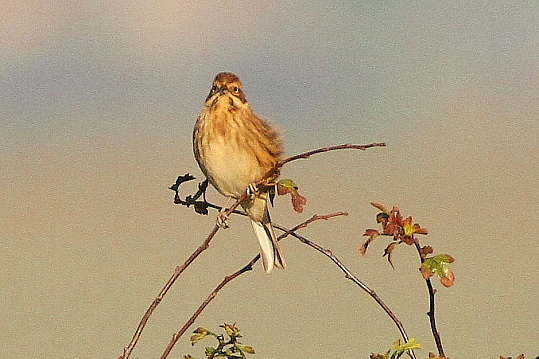 Autumn: Recorded on 11 dates from 20/8 to 29/9 with a total of 24 bird-days. Daily maxs: 20/8 7 (6 Headland and 1 Hollow), 22/8 3 Headland and 26/9 3 Belle Tout wood. Just 1 was ringed this Autumn in Whitbread Hollow. A poor year, for comparison in the Autumn of 1977, we recorded 242 bird-days with a daily max of 60 on the 8/9/77, and as many as 47 were ringed by the BHRG in Whitbread Hollow. 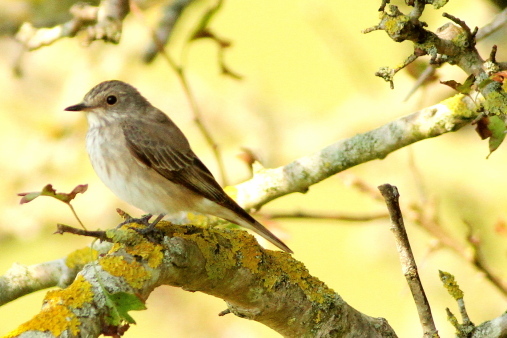 Spotted Flycatcher in Belle Tout wood. Autumn: Recorded on 16 dates from 3/8 to 22/10. A total of 25 bird-days with daily maxs: 3/8 (3) and 4/8 (5). Probably 19 different individual birds involved. Just 1 was ringed in Whitbread Hollow this Autumn. An improvement on last Autumn, but still very poor numbers compared with our earlier years. Our latest date was on the 1/11/68. In 1975, between 1/8 to 15/8 up to 8-10 migrants per day were passing through Hodcombe and 40 were ringed at this site during this period, and proved that there is a fast turnover of migrant Pied Flycatchers and this confirms that birds do not linger long because of the turnover with the number of birds being ringed. A total of 10 Pied Flycatchers were also ringed in nearby Whitbread Hollow during this same period, and a crude estimate of 150 Pied Flycatchers passed through Beachy Head area during these 15 days which included the 50 which were ringed. Without ringing taking place, this estimate would probably have been a lot lower. Autumn and good numbers were present all Autumn but no counts made. 26 were ringed in Whitbread Hollow this Autumn. Autumn: Low numbers present until mid-September. Daily maxs: First influx was on the 13/9 when 230 were recorded which included 60 came in off the sea. 22/9 1,050 were logged with 1,000 W with 40 feeding in the set-aside field and just 10 in Whitbread Hollow. 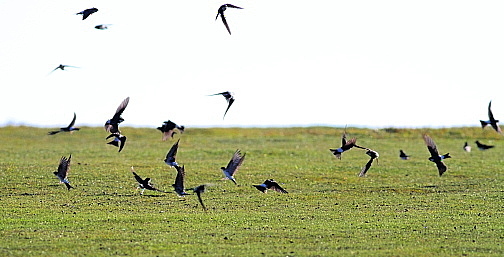 24/9 200 of which 150 moved over the Headland and 50 were feeding in the top fields. Numbers then dropped off with 90 on the 14/10 of which 60 E and 30 on the Headland. Autumn: 25/9 1 in flight Birling area (C.Holt), 14/10 1 E @ 08.20 near Birling with Meadow Pipits (MM), 17/10 1 flew over the Old Trapping Area calling (KH, RKH, RES. NP), 29/10 1 flyover between Birling and Belle Tout @ 07.20 (J.Partridge). Probably all relates to a single bird. Our 11th record and the first this century. Our first record since 2002. Autumn: Recorded on 7 dates from 17/8 (2) to 14/9 (1). A total of 17 bird-days with the daily max of 10 on the 13/9. 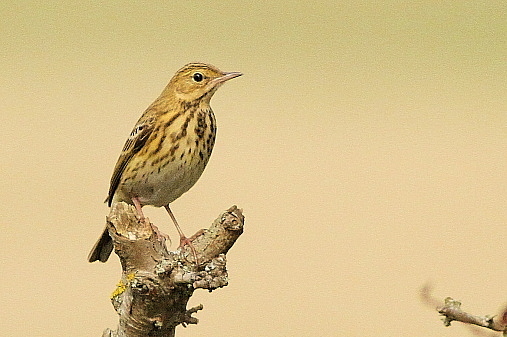 Tree Pipit near the |Hotel Garden. Autumn: Just recorded on 6 dates chiefly at Birling with a daily max of 3 on the 20/8. 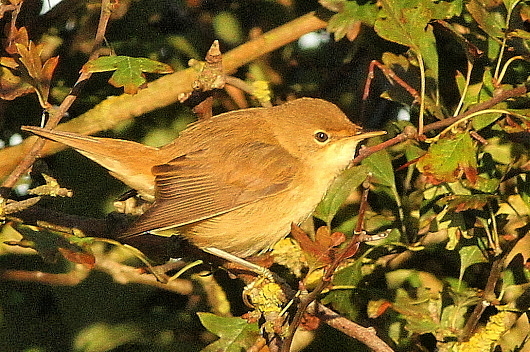 Also 2 were present around a pond at Hodcombe on the 21/10. passage recorded. Daily maxs: 28/9 (18), 10/10 (54E) and 14/10 (32 E). Autumn: 5/10 1 at Birling. (identified from photos) SL and JG. Autumn: Recorded on 8 dates from 28/8 (2) to 22/10 (1E) with a total of 12 bird-days. Autumn: Recorded on 18 dates from 17/8 to 10/10 with a total of 204 bird-days. Daily maxs: 26/8 (22) and 12/9 (54W at dusk). Fair numbers were also being reported from Cornish Farm area during the Autumn but no actual count made. Our first record and the third for Sussex. September: Headland 1/9 400 otherwise 300 in the top fields for the rest of the month. 16/10 160 W, 20/10 100 W, 1/11 300 present in the set-aside field. Autumn: Just recorded on 6 dates from 1/8 to 16/10 with a total of 23 birds. Movements: 14/10 9E and 16/10 10 E.
Autumn movements: 14/10 230 (160E and 70 on Headland), 16/10 445 (295E and 150 on Headland), 14/11 150W, 17/11 300 E.
Autumn: Recorded on 8 dates from 24/9 (1W) to 4/12 (2), with a total of 57 bird-days. Daily max: 29/10 (25 over Headland). A slight improvement from our last two Autumns but no repeat of 2015 when we recorded 766 bird-days. Autumn: Up to 60 present daily during July to September. On the 5/10 a flock of 300 present in the set-aside field, but by the 9/10 only 90 left. Diurnal movements: 10/10 230 E, 14/10 190 E, 16/10 120 E, 31/10 100 E.
Autumn: Recorded on 8 dates from 5/10 (6) to 17/11 (1E), with a total of just 54 bird-days. Daily maxs: 20/10 (14 Hollow) and 21/10 (15 Hollow). 28 were ringed in Whitbread Hollow this Autumn and all the birds which were trapped for ringing purposes proved to belong to the British race. Autumn: Recorded on 7 dates in Whitbread Hollow from 11/8 to 2/11 but never more than 2 on a day. 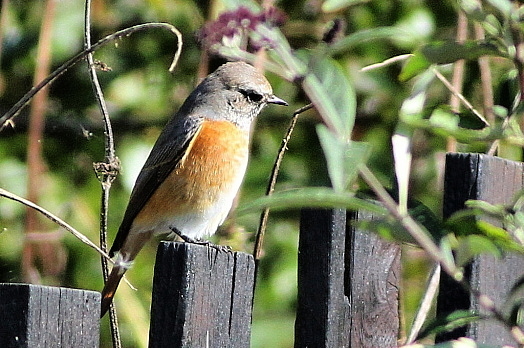 A single male was also seen in the Hotel Garden on the 16/10. 16/10 8E and 29/10 c200 passing overhead on the Headland. Autumn: Recorded on 7 dates from 15/10 to 27/11 involving 14 birds with a daily max of 7 on the 29/10. Autumn: Just a single record on the 12/8 of 1 on the Headland. 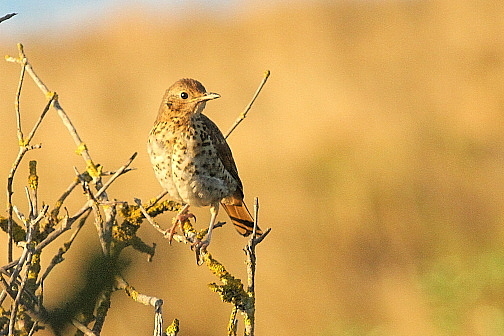 What used to be one of our commonest birds on Beachy Head with an estimated breeding population of 120 breeding pairs, back in the 1960’s and 70’s, it may be no longer breeding on Beachy Head. Autumn: Recorded throughout with 50+ present in the Birling area on the 22/8. Once again reasonable numbers have been present in the set-aside field opposite Belle Tout wood later in the Autumn: 9/10 (50), 22/10 (35), and 8/11 (25). Our 43rd record since 1960. Autumn: Recorded on 6 dates from 14/9 to 17/11 with a total of 11 birds with daily max: 17/11 (4E). Autumn: 7/8 20+ Birling, 17/8 3 in the Hotel Garden departed high to the N., 1/9 40+ Birling, 20/9 c20 along Cornish Farm track, 5/10 30 Birling.